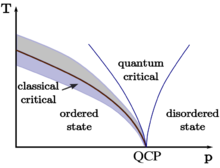 Solid-state physics is the study of rigid matter, or solids, through methods such as quantum mechanics, crystallography, electromagnetism, and metallurgy. It is the largest branch of condensed matter physics. Solid-state physics studies how the large-scale properties of solid materials result from their atomic-scale properties. Thus, solid-state physics forms the theoretical basis of materials science. It also has direct applications, for example in the technology of transistors and semiconductors. Condensed matter physics is a branch of physics that deals with the physical properties of condensed phases of matter. Condensed matter physicists seek to understand the behavior of these phases by using well-established physical laws. In particular, these include the laws of quantum mechanics, electromagnetism and statistical mechanics. The most familiar condensed phases are solids and liquids, while more exotic condensed phases include the superconducting phase exhibited by certain materials at low temperature, the ferromagnetic and antiferromagnetic phases of spins on atomic lattices, and the Bose-Einstein condensate found in cold atomic systems. The study of condensed matter physics involves measuring various material properties via experimental probes along with using techniques of theoretical physics to develop mathematical models that help in understanding physical behavior. The diversity of systems and phenomena available for study makes condensed matter physics the most active field of contemporary physics: one third of all American physicists identify themselves as condensed matter physicists  and The Division of Condensed Matter Physics (DCMP) is the largest division of the American Physical Society. The field overlaps with chemistry, materials science, and nanotechnology, and relates closely to atomic physics and biophysics. Theoretical condensed matter physics shares important concepts and techniques with theoretical particle and nuclear physics. A variety of topics in Physics such as crystallography, metallurgy, elasticity, magnetism, etc., were treated as distinct areas, until the 1940s when they were grouped together as Solid state physics. Around the 1960s, the study of physical properties of liquids were added to this list, and it came to be known as condensed matter physics. According to physicist Phil Anderson, the term was coined by himself and Volker Heine when they changed the name of their group at the Cavendish Laboratories, Cambridge from "Solid state theory" to "Theory of Condensed Matter", as they felt it did not exclude their interests in the study of liquids, nuclear matter and so on. The Bell Labs (then known as the Bell Telephone Laboratories) was one of the first institutes to conduct a research program in condensed matter physics. However, references to "condensed" state can be traced to earlier sources. In the introduction to his 1947 "Kinetic theory of liquids" book, J Frenkel (see Yakov Frenkel) proposed that "The kinetic theory of liquids must accordingly be developed as a generalization and extension of the kinetic theory of solid bodies. As a matter of fact, it would be more correct to unify them under the title of "condensed bodies"".